When the player crosses the portal threshold, there is at times this annoying greenish flash. That not seem to happen when backing up . Is there a way to get rid of this ? Last edited by Kappes Buur on Fri Jan 06, 2017 21:16, edited 1 time in total. It's almost like the player is getting through the portal before the viewpoint is and you momentarily see the back of the player. The last issue causing this got fixed just today. 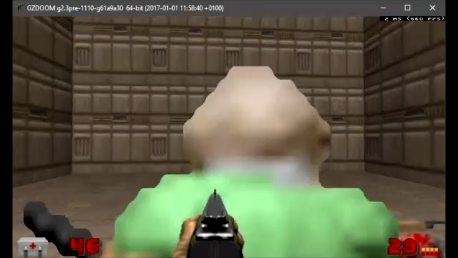 It was all caused by interpolation having the player not really where it's supposed to be and causing some checks being off and sometimes failing. Using today's build from the dev builds site (gzdoom-x64-g2.4pre-39-gb11c8fe) I'm still seeing this issue. Should that version include the fix or has it not been committed yet? Can you reproduce with clean ini? If not, which settings must be activated? Yup, installed to a completely clean directory and still got the effect. when backing out through the portal. I really hope this was the last of those ugly edge cases with non-static line portals. Their entire setup makes it virtually impossible to properly determine if the player needs to be drawn or not because it may not only appear near the portal but also elsewhere in the scene if two spots connect that are visible from each other. It still happens with GZD-x64 g2.4pre-42. Does this flash have anything to do with the chasecam, since the image seems to be the back of the player. And if it is, would it then be feasible to disable the chasecam for the duration of the portal transport? Have you tried the new official release of 2.3.1 (which is newer than that build)? The new release fixes it for me and the Git changelog didn't mention the fixes until after the build you are trying was made. fixed some edge cases with visible player sprites through non-static line portals. This required reinstating some code which I thought was no longer needed. I just downloaded and tried 2.3.1 and no glitch detected. Warning: With the January 10 git builds, this map now causes a crash. Bug report submitted.